... resources to examine characteristics of places of population concentration -- America's more than 29,000 incorporated and census designated places in the 50 states and D.C. Use the interactive table in this section view/rank/compare characteristics of the cities/places and how they are changing. Post-census population estimates are included in the table. The table provides a means to examine places designated as principal cities (1,233) in the the new metropolitan areas. See details about examining metro principal cities. See more about cities/places below. Use the CVXE GIS Visual Library to examine characteristics of city/places in context with related geography and multi-sourced demographic-economic attributes. 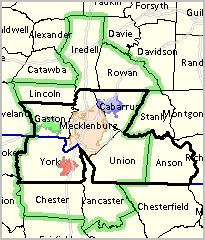 The map at right shows the Charlotte-Concord-Gastonia, NC-SC MSA illustrates use of the CVXE Visual Library: five county Census 2010 vintage and the ten county 2013 vintage. Click map for larger views and details. Examine related illustrative GIS/mapping applications focused on educational attainment, patterns of economic prosperity and population distribution in the Gallery section. A partial list of city/school district Gallery sections may be accessed using the links shown in the scroll box above the map at right. Table includes multi-sourced data for all Census 2010 cities/places in the 50 states & D.C.
See usage notes below ranking table. See related interactive tables.  Click State (dropdown below table) to view places in a selected state (click ShowAll between selections).  Click Metro Principal Cities (dropdown below table) to view places that are metro principal cities (click ShowAll between selections). to filter for only Census Designated Places enter CDP in text box (case sensitive). Value of -1 in table cell indicates data not available. As of Census 2010, the population in principal cities of metros in the 50 states and D.C. was 108,513,218, 47.5% of the population in all cities/places (228,457,238). Follow these steps to view attributes of principal cities in a selected metro using the above ranking table above. 1. Click the ShowAll button below the ranking table. 2. Enter the CBSA code for the metro in the edit box to the right of the CBSA button below the ranking table. 3. Click the CBSA button. The table now shows a filtered view of only the principal cities in the selected CBSA. It is easy to compare attributes of these these four cities. The graphic above shows that the percent high school graduates in Charlotte was 87.9% (based on ACS 2011 5 year estimate). Compare the high school graduation rate in Charlotte to the rate in the other principal cities. Cities and places, or more generally places, are geographic areas of population concentration. Incorporated places are political areas having certain governmental powers designated by the corresponding state. Unincorporated places, or Census Designated Places (CDPs), are statistical areas having no official standing and no governmental powers but are recognized as being areas of population concentration. Wide-ranging demographic-economic estimates are developed annually for the approximate 29,500 incorporated cities and CDPs based on the American Community Survey 5-year estimates. Incorporated Cities/Places. The legal designations, powers, and functions of incorporated places vary from state to state. Incorporated places include cities, towns (except in New England, New York, and Wisconsin), boroughs (except in Alaska where boroughs are treated as equivalents of counties and New York where five boroughs comprise New York City) and villages. 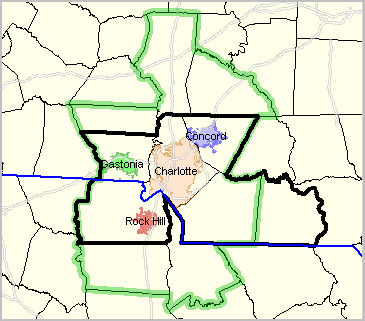 Incorporated places can cross both county boundaries. Boundaries for incorporated cities are updated annually by the Census Bureau. Model-based population estimates are developed annually for incorporated cities. There are approximately 19,500 incorporated cities in the U.S.
Census Designated Places. A Census Designated Place (CDP), is the statistical counterpart of incorporated places and are delineated to provide data for settled concentrations of population that identifiable by name but are not legally incorporated under the laws of the state in which they are located. CDPs are delineated cooperatively by state and local officials and the Census Bureau. Current estimates are not developed by the Census Bureau for CDPs. d) Any additional incorporated place or census designated place with a 2010 Census population of at least 10,000, but less than 50,000, and at least one-third the population size of the largest place, and in which the number of workers working in the place meets or exceeds the number of workers living in the place.